Over the weekend Donald Trump addressed the graduating class at Liberty University, the fundamentalist college founded by the late Jerry Falwell and now led by his son Jerry Jr. It was Trump’s first commencement speech and the venue indicated that he was there to pay a favor. White evangelical Protestants supported Trump like the had not supported other GOP candidates in recorded history. His speech should concerns all of us who cares about the secular state and maintaining the growth that the secular population has enjoyed in the last decade. David Niose and Rob Boston, two of the best and most experienced voices on issues of church-state separation have very gloomy reactions to the speech. While there’s some overlap in their assessments, they highlight some separate issues. Of course, here Trump refers to his infamous executive order on religious freedom. As Mark Silk notes, the EO really amounts to not a lot in practice. This doesn’t mean that we should take our guard down. The Religious Right has the Johnson Amendment on the cutting board and Republicans hold power in all three branches of the federal government. Boston focused his concerns on Trump’s view of the role of God in America, and in American history. He’s right to be concerned. With the Religious Right-led GOP in power many issues of church-state separation are already coming up and will continue to come up. It is possible that we will get into a social and political environment where people on the fence, such as many nones, will stop identifying as such and return to their old religious labels. This could happen because people may fear the social, economic, and political consequences of not identifying as or been seen as religious. We are in for a wild ride in the 3 3/4 years we have left in this mess. Trump may not be an evangelical, but he knows they got him elected. More important, they know it. American Atheists is having a regional meeting in Puerto Rico this weekend. When we think of Puerto Rico and religion, there’s an assumption that all of the people in the island are Catholic. For example, in the 2008 exit polling of the Democratic Party Presidential Primaries the media companies in charge of the Exit Poll Pool decided to leave religion out of the Puerto Rico questionnaire. This issue was addressed by my former colleague Mark Silk who promoted a comment I had made in a previous post on that primary. 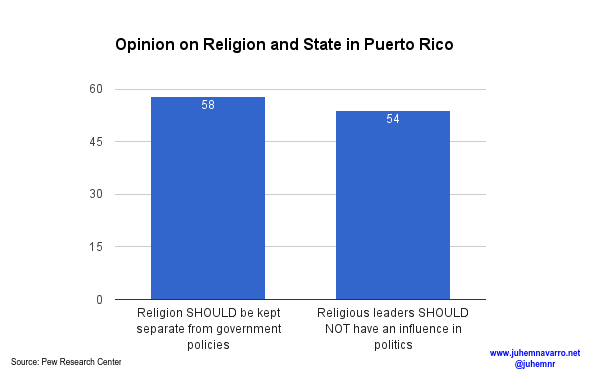 Unfortunately, there’s not a lot of research polling on religion in Puerto Rico. Luckily, the Pew Research Center included Puerto Rico in their large study of religion in Latin America last year. 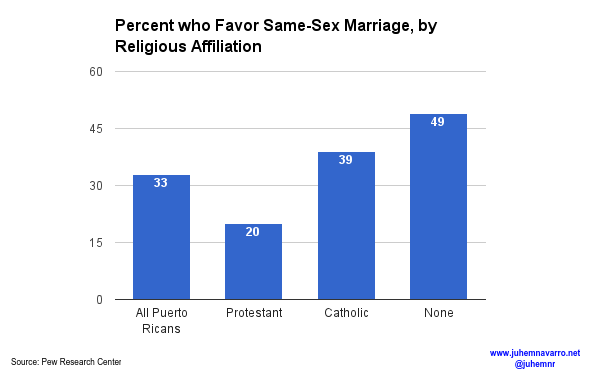 According to the Pew poll, 8 percent of Puerto Ricans are what they call “religiously unaffiliated.” They’re basically people with no religious identification. 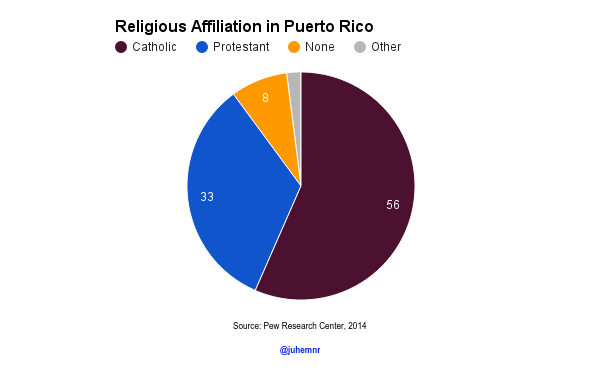 The majority of Puerto Ricans still call themselves Catholic, but a large segment of the population, one-third (33 percent) to be precise, are Protestant. What about atheists? The topline results of the poll (page 33 here) show that only 1 percent of Puerto Ricans identify as atheist. We must remember, though, that religious identification and religious belief are two different things. It may well be the case that some people in Puerto Rico do not believe in a god, but do not identify their religion as “atheist.” I know, because I am one of those persons who refuses to identify atheism with religion. Fortunately, Chapter 3 of the report includes a discussion on religious beliefs. It does not seem to be the case that there are more nonbelievers than self-professed atheists. Ninety-nine percent of Puerto Ricans claim to believe in God. This makes the 1 percent figure of self-identified atheists and non-believers consistent with one another. But we must not despair. Eight percent of the adult population are religious nones. Although 91 percent of them claim to believe in God, we need to understand these numbers in their context. Many of these nones may be going through a process of rethinking their beliefs. Only 3 percent of Puerto Ricans claimed that they grew up with no religious affiliation and that number has nearly tripled. 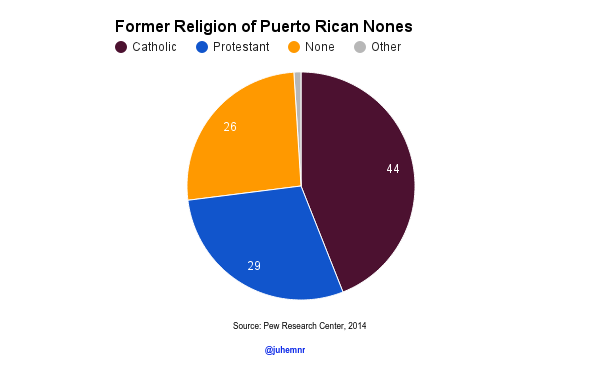 The Nones in Puerto Rico are mostly former Catholics and Protestants. The growth of the Nones in Puerto Rico is not just the case of non-practicing (or nominal) Catholics just admitting they don’t really have any attachment to the old religion and that’s encouraging news. Nearly 30 percent of Nones are former Protestnts, so even people from the group that has the highest rates of church-going and belief are leaving. Considering how pervasive religion is in Puerto Rico, this is a big deal. This is a place where substance abuse treatment is openly religious, and addiction is classified as a “spiritual ailment.” This is a place where education, little by little, has become privatized and taken over by “nonprofit” ministries. A place where the police organize traffic stops to preach. I did not identify as an atheist until I moved to New England after graduating from college. I identified myself a “deist,” a believer in a higher power. The very secular culture of New England made it safe for me to be openly atheist. I did not feel that comfortable being an atheist in Puerto Rico. Maybe the high visibility of the convention, combined with the introduction of the Church of the Flying Spaghetti Monster and groups like Humanistas Seculares de Puerto Rico and Ateistas de Puerto Rico openly challenging the privilege religious organizations have in everyday government functions will change the dynamics. And the future seems bright. The Pew poll also shows that the nones in Puerto Rico are, on average, 7 years younger than Protestants and 10 years younger than Catholics. I wish I had institutions I could rely on two decades ago. Hopefully the new generations of non-religious Puerto Ricans will experience the freedom I couldn’t feel.